Sometimes you need a screwdriver that can fit into tiny places, even if you can't apply a lot of torque. Even though the Teeny Turner is only 2 5/8" long (with a bit inserted), it still provides a decent grip. The seven bits can be changed rapidly and are held securely in the shank with magnets. Quality crafted in Canada using aircraft alloy steel. Colors vary. 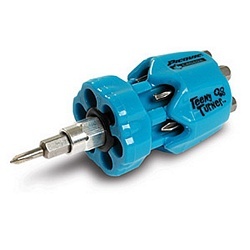 I agree that it is one of the best mini screwdrivers out there!! Pros: I bought this instead of a small plastic box set for use in my laptop bag. I am SOOO glad I found this instead. Has all of the bits I need to work on my HP ProBook laptop. Teeny Turner Is the Best Screwdriver Ever! Pros: Small, compact, lots of bits and high on torque. I bought two and probably should of bought a third. I keep one upstairs and the other screwdriver down stairs. I like having a screwdriver with lots of bits and small in size that fit so many of things that my standard driver does not. 6 out of 19 find this review helpful.